This is getting silly. Revisiting this film on St George’s Day was a curious inversion of time and space. Wait a minute here…the English/British aren’t supposed to be that good at anything any more, declinism fuelled by lack in the NHS and public services, the Millennium Dome, the scandalous Olympic overspend. It is thus perhaps perverse (or maybe salutary) to stand up and shout for two plasticine models as the vessels of greatness, but Wallace & Gromit refuse to be anything but standfasts for standards in 21st-century UK. No ifs, buts or maybes – this is a very, very good movie, judged by whatever criteria you care to mention. One almost now yearns for Nick Park and the whole bally Aardman crew to trip up (although Shaun The Sheep might yet prove their Achilles heel). Not here though, not yet. Put it this way – what other cultural franchise in the UK can have grumpies and tinies alike in fits of laughter? The allaince with DreamWorks, the dalliance with CGI – neither really harms the daffy conceit of the whole. Master and pooch have hit the big time as human pest-controllers – until, that is, thanks to Wallace’s intervention, a terrifying, outsize rabbit is set loose among the cabbage patches and cold frames. A great rock musician this writer once talked to spoke of British music-making as shamateurism meeting amateurism, comparing it to Churchill building his brick wall at Chartwell. Park gets this. Wallace is the well-meaning, occasionally inspired meddler, whose intention is to make dull, quotidian actuality much more efficient and exciting and less demanding, but whose means are constrained by those very faultlines. From the Morph animations and A Grand Day Out (1989), Aardman has been essentially a cottage industry but loved planetwide, as class a marque as Barbour macs and Tiptree jams. What those concerns do is take the veneer of amateurism and turn it by sleight of hand into super-professionalism. The toy train sequence in The Wrong Trousers (1993) is a case in point. It could not have been simply knocked up. Its flawless borrowing – but always with integrity maintained – from Tom and Jerry remains one of the funniest pieces of British film-making. Half-assed dilettantes don’t do that. There’s more of the same in this recondite whimsy in which the pace becomes so fast at times it feels more like a PE lesson than watching a film. Much is always made of the ‘typical Britishness’ of the settings, of Peter Sallis’s salt-and-vinegar delivery as Wallace, but the series’ gift is to subtly elide a whole mess of pop-cultural references that makes modern Britishness what it is. 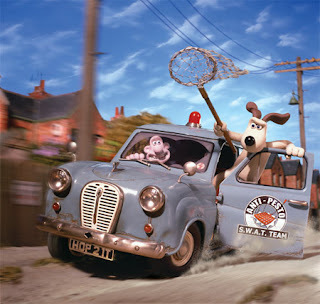 This is done with such elan and sheer entertainment value that isolated villagers in the hills of Sarawak or Paraguay may one day yet come to regard Wallace & Gromit, and not David Beckham or Bobby Charlton, as the ideal avatar of Britishness.